He is not the only messenger to mankind. But somehow the power of his story and his words and his character made it possible for his testimony to have a global impact. Moishe the Beadle was a messenger, too. But the testimony he delivered was not received. When Wiesel was a little boy growing up in the town of Sighet, Moishe was the “jack of all trades” at the local synagogue. The most menial job. The Beadle. Moishe kept to himself. Few spoke to him. But young Eliezer Wiesel did. Wiesel was very religious, and he often found Moishe chanting prayers. They struck up a friendship. In 1941, Moishe and some other Jews who could not prove their nationality were deported by the government. Months later, Moishe returned. Wiesel recounts what happened next. “When he came back, he began talking. Nobody listened to him." Three years later, the Nazis arrived. All the Jews of Sighet were rounded up. Barbed wire was put up. 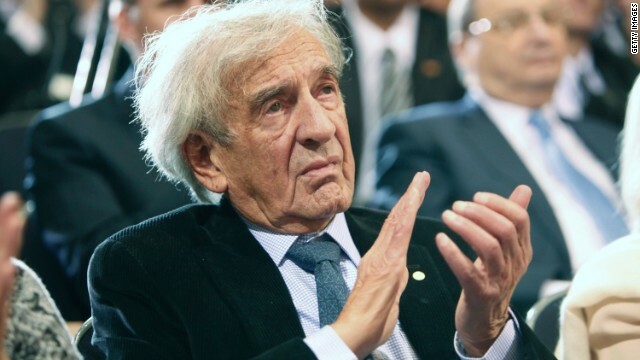 When Eliezer Wiesel and his family arrived at Auschwitz, the name meant nothing to them. They’d never heard of it. And then another messenger. This one, heeded. “He said 48 or something." “No,” said the old prisoner. “Say 30." “He knew what we didn’t know,” Wiesel said. "That those who could work will live. Those who couldn’t would die. “And then,” Wiesel said, “something strange happened to me. "I come from a very religious background. Very religious. And all of a sudden, when I saw these hundreds and thousands of Jews coming, from all over Europe, speaking all languages, belonging to all cultures, to all conditions, men, women, children, young and old, learned and ignorant ... I had the feeling that this is a messianic event. The ultimate ingathering of exiles. "The Messiah is coming. ... That’s what I felt. The story of what happened next is so thoroughly documented, it does not need to be recounted here. Wiesel says he retained his will to live in the death camps because his father’s life depended on the survival of his son. Together, father and son survived Auschwitz. They survived the grueling transfer to another death camp, Buchenwald. And there they survived until his father could survive no longer. One morning, Eliezer Wiesel woke up, and the bunk in the barracks where his father had been was occupied by another inmate. Two months later, American soldiers liberated Buchenwald. Elie Wiesel would survive to become a messenger, one of the first messengers whose testimony broke through into the broader public’s consciousness. Now, on this day, as the U.S. Holocaust Memorial Museum commemorates its 20th anniversary, there are enough messengers, enough testimony, enough documentation to absorb many lifetimes of study. And just last month, we learned something new and shocking from researchers at the Holocaust Memorial who had spent years combing through documents for evidence that others had glossed over. They discovered that there were an additional 45,000 ghettos and concentration camps - some devoted to killing small number of people - scattered all through Nazi-occupied Europe that we never knew existed, which means even more civilians were aware than we even knew. How does faith survive such evidence? How could God allow such a thing, the faithful asked while it was happening and long after. Could it be that, even though he did not look the part or act the part - even though he appeared to have lost his mind - could it be that Moishe the Beadle was a messenger of God? Bill, if you were to go ahead and just die in a fire, that would be okay with me. You don't really need my permission." God speaks to people all the time. In 2008, He told Boyce Singleton Jr. to shoot and stab his pregnant girlfriend. Deanna Laney heard God direct her to bludgeon her three sons, aged 9, 6 and 15 months. Only the youngest survived. Blair Donnelly received instructions to stab to death his 16 year old daughter, Stephanie. Christopher Varian was slaughtered with a cheese knife after God spoke with one of his employees. God told Jennifer Cisowski to dash her infant's head on the rocks, so ""Just like Jesus raised Lazarus, I threw the baby on the stones by the pool." Khandi Busby got a direct message from God advising her that the only way to save her 6 and 8 year old boys was to toss them off a bridge in Dallas. Fortunately, they survived. Angel Rico says he received a divine command to strangle his 4 year old son, so he did just that and left him at the side of the highway. Lashaun Harris threw her 3 young kids into the San Francisco Bay after God let her know that He wanted a human sacrifice. All of these people have been found legally insane by the judicial system, so if you hear God's voice speaking to you, it's time to check with your local psych ward to see if you need a huggy jacket. Joel/Marvin, If in fact you are not the same poster. You know there is no evidence for a god. If you're satisfied that the sky fairy will send you to a better place why get so worked up? In fact why delay your meeting with it? "In Santa we trust"... If someone showed you an automobile (say, a Lamborghini) would you take is as evidence that those who created this beauty EXIST? Now you may look at the skies and the trillions of stars, galaxies and other objects there and apply the very same principle to the Universe. Marvin... Your use of a couple of Hebrew words (Tanakh and Shalom) suggest that you're addressing your message to Jews. If so you should be aware that religious Jews were waiting for their Messiah for thousands of years and that they would gladly accept Him if the Messiah succeeded to PROVE that he was indeed a Messiah. Obviously, Jesus failed to do it and was, therefore, either unable (pretty unlikely considering that he was God's almighty son) or unwilling to PROVE that he was the Messiah. I can only hope that the next time Jesus will visit this world he will succeed better and then the Jews will gladly accept him. I, at one time in my life, worked hard to be good enough to enter heaven; just like any good Muslim, Hindu, Buddhist or even Christian. I was always so frustrated when I failed in achieving self righteousness. Then I realized that I was flawed. My carnal mind would frequently lead me astray. I could never achieve righteousness on my own efforts. I certainly was also guilty of passed sin. I could never stand before a holy God in judgment. Then I realized that Jesus Christ already achieved the righteousness that I was working so hard towards. Jesus Christ did it all for me. I was freed from my carnal limitations. I am holy in Christ. I can stand before God in judgment and have Jesus Christ plead my case for me. Thank you Jesus. Amen Geoffrey. How wonderful to stop striving and to receive His grace freely. Jesus paid it all! Great post, Keep it up! Might not the finitely infinite relate to an enormous number beyond our rather mundane comprehensions? Again, your innate desires to ridicule one's Word usages rather than comprehend them shows your intellectual mindlessness. My speculative assumptions might one day become a scientific relevancy. Maybe they will end using a word phrase you will coin up. Generally you're a useless t-w-a-t.
And yet, like your problem with the word cosmology, you are merely ignoring that something cannot be finitely infinite. This is your standard avoidance of any criticism. Reassert and cloak it in pseudo-intellectual nonsense. Again I ask you, "Might not the finitely infinite relate to an enormous number beyond our rather mundane comprehensions?" I think outside the boxes as have many legendary folks. Criticize me all you care to. I will not be moved. Try and debate me without crucifying my Word. Where is your alternative Word to be had regarding the Triune Cosmologies of Spatial Relationships? Is there an alternate Word for such a relevancy? Hey LL.........please follow link cool science..................then read comments............and comment thanks for the help ! LL is the belief blog pseudo intellect who's posts are a complete joke, so don't bother reading them, just laugh and move on. "Try and debate me without crucifying my Word." Capitalizing "word" as if yours are special? Are you really that pretentious? "Finitely infinite" is a mathematical oxymoron. "Now, on this day, as the U.S. Holocaust Memorial Museum commemorates its 20th anniversary, there are enough messengers, enough testimony, enough to absorb many lifetimes of study." Yes indeed! Keep the faith! God does not need religions to be God. God was God before any religious scriptures told and foretold. God was God before celestial life came into existence. God was God before the Cosmos was created. God was God long before time came into being. God will be God long after mankind ascends into the celestial chasms. God will be God long after this earth passes away. God will be God past, present and in the future. God will ever be God. God never changes. My personalized faith in God needs no ancient scriptures to know of God. My honesty in my Word regarding my perceptions about Cosmologically dependent relationships being all things within the grids of spatial chasms seems for you to be unknowable and void of your understandings. I've told you time and again that there are but 3 cosmologies inherent for being understood in order for anyone come to an understanding their intentional meaning. You Hg, are the cowardly one who cannot even attempt to woefully rationalize my Word regarding the Triune Cosmologies of spatial interdependencies. And yet, when you yourself gave the definition of cosmology, it showed quite clearly that the way you use it is not applicable. You also refused to answer the question of so what? Certain things seem similar, so what? You've avoided that all yesterday, and will probably continue to avoid it. Also, you demonstrated once again your self-indulgent, self-serving, piousness in your capitalization of Word when talking about what you say. Your desires to 'railroad' a debate is noted. Your innate abilities to fathom other's Word generalities used in ways that seem to you to be wrong is your intellectual downfall. How cute. You still are unable to actually address the points in the post. Your integrity is absolutely 0. You refuse to address any criticism, and you actively distort what you say to mask the fact that you're just another dishonest religious apologist. hawaiiguest stated, "You also refused to answer the question of so what? Certain things seem similar, so what?" The similarity of the atomic cosmos and the celestial cosmos is most likely due to repeti tiveness of structuralizing methodologies manifesting itself into duplicitous natures of self-similar regularity. As I made mention within a prior post, there are finitely infinite amounts of Big Bangs that started multiple 'universes' within the grand scheme of the Grand Cosmos which is so great in scale, we will never see its fullness. 1) You cannot have something finitely infinite. It's just not possible. 2) All of that is all speculation and assumptions. Me? A religious apologist? Hardly! Oh really? Are you trying to say that your in view of your original post, that this "fractal cosmology" nonsense isn't tied to the bible, even though you consistently bring up the whole "kingdom of god inside us" in conjunction with your constant assertions? So, my kingdom domains of God ideology makes me out to be a religious apologist? I have never apologized for any religion! Their days are numbered. My years are also. Wow, you really like equivocation fallacies don't you. Equating one usage of a word with another. Ignoring colloquial usage, and completely avoiding addressing the problems within your posts. Does it make you feel good to be so dishonest? Fractal Cosmology is a view that came into being and is now just in its infancy and needs to be reiterated and congealed into a state of there being only 3 structuralized commodities. One being the atomized cosmology and the second being the celestial cosmology leaving the third to be the cellular cosmologies. Our transcendence or our ascension to either the atomic or the celestial cosmos hierarchies may well be based upon our psychic desire. Either we go up or we go down. My desire is to transcend into the cellular cosmos after I die. Many though are transfixed into going up into the celestial 'heavens' after death becomes them. And you Hg? All of that was complete, speculative nonsense. You continue to misuse cosmology, and you continue to merely reiterate your position without justification or evidence other than "these things seem sort of similar". Not to mention that you completely jumped to a different facet of this entire discussion to distract from your earlier statements, just like you did yesterday, and also is a wonderful demonstration of why I call you a dishonest coward. Where in my post have I shown any sense of dishonesty? Just because I see a very plausible relationship between a few verses of scripture relating it to my perceived understandings of the Triune Cosmologies of Spatial Relationships does in no way make me out to be transfixed by religious dogmas. At least you have a grasp as to understanding the gist of my perceptions. Maybe one day you will see the fullness of my Word. Oh, brother. "One day, you will see the fullness of my Word." Yeah, you don't have a god complex, do you, LL? Think you're some sort of prophet? Your word is full all right. Full of drivel. Who is it you make me out to be? God or prophet? Perhaps one, maybe both? All that I am is just a 'son of man'. Are you just incapable of actually practicing reading comprehension on posts with common vernacular? Or are you such a dishonest little douche that you will claim you're not dishonest while being completely disingenuous about your own tactic. "God does not need religions to be God. " - I agree. People, however, need something to believe in as your preach above proves... and, as most other religions, yours also claims that it is the only truth and that all other faiths are wrong. Enough already with this, Hitler was evil and he was put down like a dog, too bad he killed himself instead of some lucky soldier getting the chance. WW2 ended over 65 years ago, we have plenty to remember it by, give it a rest. Civil War, WW1, WW2, Korea, Vietname, etc, enough with the war memorials and their PRBS. This is only to stir up patriotism so the next time they need people to die for their country they have plenty. And don't give me that, "those who do not learn from the past are destined to repeat it", I don't need to be told not to round people up and kill them. I have allerted the ADL. Maybe you don't need a reminder of how bad hate can get, but others do. Sadly others still haven't figured it out yet. Abortion is justified by dogma of dog ism,secular ism, self center ism in hindrance to truth absolute of right of life of a fetus, A living being with in process of growth according to dark matter, or his spirit. also known as program, nothing can be formed without. it is a crime of a worst kind against defense less by hindu atheist, self centered, deserving of prosecution as killer of living being, because, SEED IS A PLANT, AND PLANT IS A SEED, IT SPROUTED FROM. Shame that the prophet of Islam was not aborted. POTUS says "God bless you" at the end of Planned Parenthood speech? What about the Holocaust of 70 million plus babies? Obama/Gosnell=Murder Inc. Besides Obama is trying to create a 2nd Holocaust with Israel by placing their enemies at their borders, arming them to the hilt with M1A1 main battle tanks and F-16's, and then dividing up the land and changing those borders to make them indefensible. And yet the Jews stilll support him? They may as well just line up for the gas chambers. Fools. What kind of person supports the murder of defensless people? If babies carried guns, maybe they wouldn't be aborted. God bless us? Really? Ain't gonna happen. Seriously, shut the hell up. Don't you have a right-wing manifesto you're supposed to be busy writing? So you approve of the slitting of babies throats and snipping their spinal cords with scissors? What's the matter, a baby swimming in the toilet appeals to your demon-possessed mind? You support the spilling of innocent blood on the altar of abortion? Don't be surprised when God judges this nation for not stopping this atrocity. Don't be surprised if it's more than the 70 million+ who were aborted that get THEIR blood spilled in the streets of this wicked nation. God is patient and desires that we repent. Thanks to people like you, this does not seem likely. It's a woman's body and she may decide what to do with it, A fetus is not a developed baby. You and your insane beliefs may not tell others what to do with their bodies. And there are no gods to judge us, that's all in your head. I'm not sure I should even care about dead fetuses that aren't even my own. Is this because of that nonsense where people think we have souls trapped somewhere in our body? because that's silly. Baby – A very young child, esp. one newly or recently born. People I give you the perfect example of a delusional christian who sees demons. Oh look! Another tea troll! You are the same type who oooh's and ahhhh's over what you think may have been a puddle of water on Mars that PROVES there once was LIFE there! Yet, a living breathing BABY is not life?! Ladies and gentlemen-the reprobate mind in action. ss, maybe some foreign invader(Russian, Chinese, North Korean) will snip your spine for ya. We'll see how you like it. What????????????? "Yet, a living breathing BABY is not life?" UMMMMM fetus gets all of its oxygen and nutrients through the placenta and umbilical cord-a process called fetal circulation.